JGarden Description: Presented to the Town of Hope on July 27, 1991, this garden was built by local Japanese Canadians for two purposes. It was designed to commemorate the Japanese interned during World War II in the Tashme Camp, located about 20 km east of Hope on Highway 3. It was also intended to demonstrate Japanese culture to the general public. The design and construction were supervised by the Japanese Gardeners Cooperative of British Columbia. The garden is quite small and consists of a clipped yew hedge bouding a roughly square garden space that is located on Wallace Street in the corner of the much larger Memorial Park and next to the Town Hall (325 Wallace St). Two stone sentinals guard the single gateway. Three large cherries shade the west edge of the space with a large stone and waterfall on the North side. The hedge on the north side frames a view of the mountains that surround Hope. The center of the garden is dominated by a pond. The garden is also planted with hostas, ferns, black pine and japanese maples. A small stone lantern has been erected at the north end of the pond. 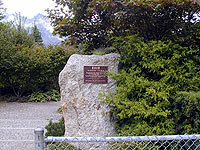 The inscription reads, "Erected through proceeds from the 1976 Tashme Reunion held at the Japanese Canadian Cultural Centre. Don Mills, Toronto Ontario"